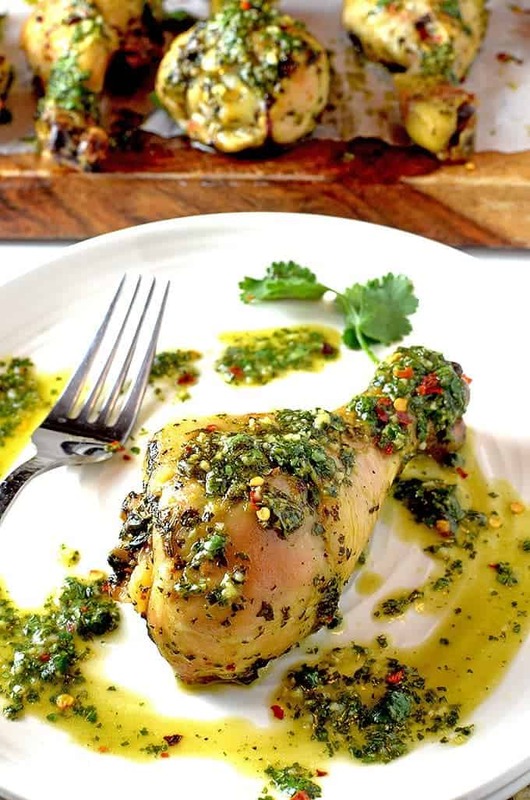 Chimichurri chicken makes for a flavorful and lively meal that is good for your health and good for your wallet. OK. Maybe I live in a closet (although I can assure you that isn’t the case). Why then had I not heard of Chimichurri until earlier this week when I finally made a reappearance at our gym? As I was making my way toward the treadmill, I came across a podium with a couple of healthy recipes that were on display for gym members. I popped a copy of the recipe into my workout bag on my way out and this is what happened when I got home, later that day. Other flavorings like garlic, salt, pepper, etc. 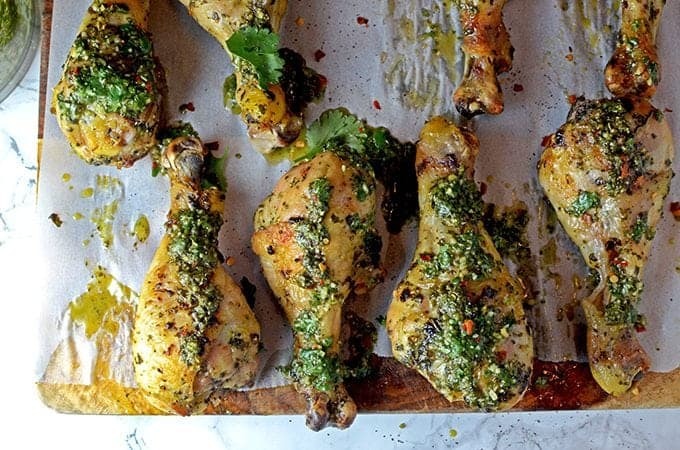 We like a little zing in our food and so we added some hot pepper flakes to this Chimichurri Chicken. Some other seasonings that would work include cumin, paprika, and oregano. Although Chimichurri has its roots in South America, it has many of the same seasonings associated with Mexican-style foods and therefore makes for a healthy food to celebrate Cinco de mayo. 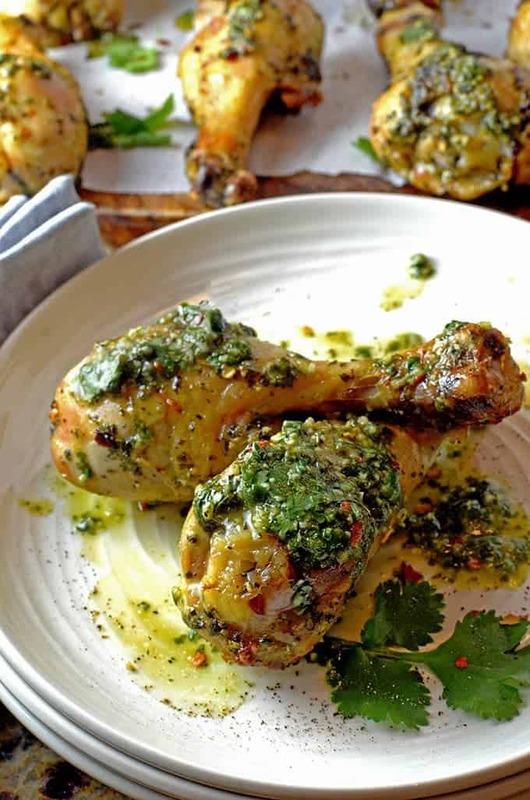 We baked these Chimichurri Chicken Drumsticks but you can use the marinade for delicious grilled pork, beef, or chicken as well. 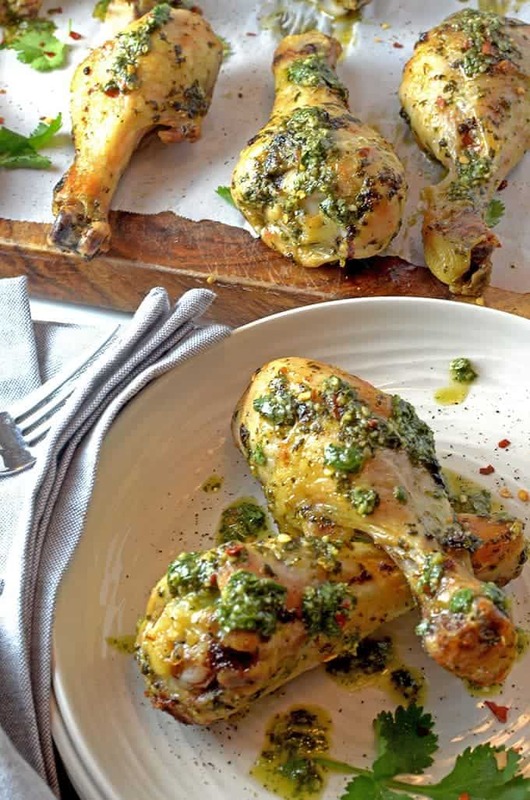 This Chimichurri Chicken is super simple to put together. 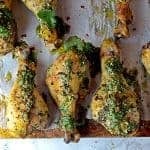 Once the meat is in the marinade, it just needs a short stay in the fridge, maybe for a good hour or so, You want the meat to take on the flavor of all of these beautiful flavors. You can even let it soak overnight for a solid marinaded flavor the next day. Combine all of the ingredients for the Chimichurri sauce in a food processor and pulse process until cilantro is coarsely chopped. Pat the chicken try and put it in a large mixing bowl. Pour all but 1/4 cup of Chimichurri sauce over the chicken and reserve remaining sauce. Stir the chicken or mix with hands until it is well covered by the sauce. Cover the bowl and place in refrigerator for at least one hour or overnight for the next day. When you're ready to make the Chimichurri Chicken, preheat oven to 350° F. Bake for about 50 minutes or until done. Finish under the broiler for 1-3 minutes for a nice, crispy finish. 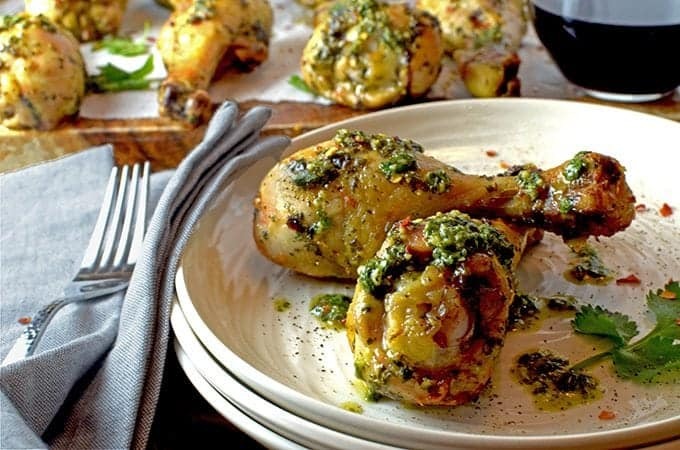 Serve the Chimichurri Chicken while hot and top with the reserved Chimichurri sauce. This looks amazing guys – love all the ingredients in this CHimicurri chicken recipe! Don’t laugh, but I only heard of it recently too! I’m like you, when I see a recipe that intrigues me – I photo copy it and try to duplicate it. Sometimes the recipe is worthy to make the blog- other times – not so great. Have a great week gentlemen!! Also your photography, IT’S GORGEOUS. Thanks so much, Anne! I appreciate your kind comments! Omggg this chicken looks AMAZING!!! Loving the green on this! It’s incredible that I have never made Chimichurri sauce and it’s so easy. 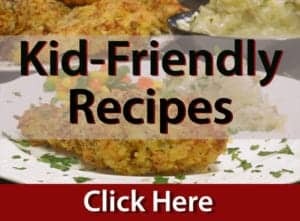 You can make a large batch a use it for different dishes the whole week. Amazing guys! Thanks so much, Carlos. For sure, this one is full of ease and flavor! 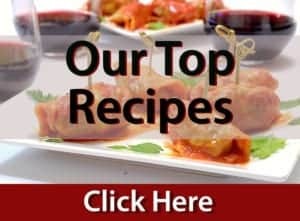 Thanks, Pamela – we really enjoyed this chimichurri recipe!